These liquid level switches are sealed with potting compound. The only path for liquid to the electrical switch would be through the wires. If the wires are terminated in an appropriate manner (e.g. 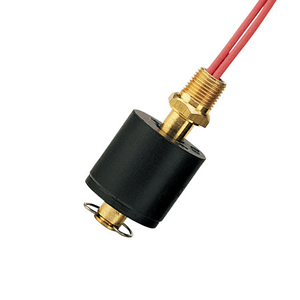 —NEMA-6 connectors), the level switch will meet or exceed a NEMA-6 rating, making them suitable for submersion with years of worry free operation in moisture-laden environments. A sealed SPST switch provides consistent accuracy and high repeatability with the effects of shock, vacuum or vibration minimized. The switch is extremely versatile since it is user selectable as a normally open or normally closed by simply reversing the float or the mounting of the switch. The standard NPT male fittings allow for quick installation in either the top or bottom of the tank or vessel.